Child Welfare Scheme Nepal (CWSN) is a NGO working for and with the children and young people of marginalized communities in the areas of health, education and protection for last 17 years. CWSN's Asha Health Care Programme provides quality Primary Health Care (PHC) and Maternal and Child Health (MCH) services in urban and rural areas of Kaski. 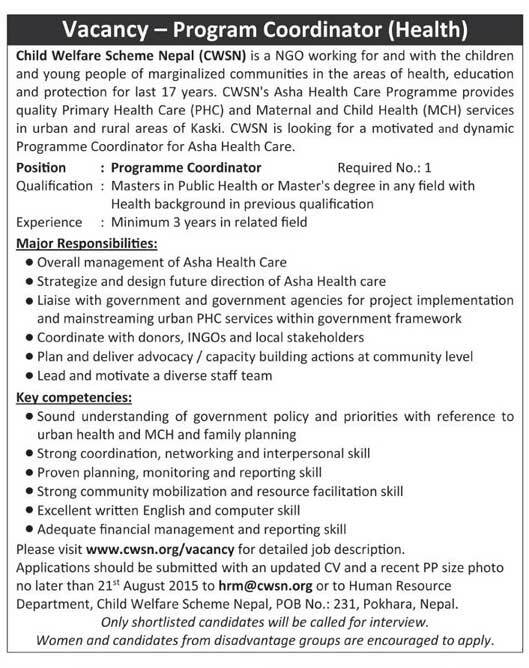 CWSN is looking for a motivated and dynamic Programme Coordinator for Asha Health Care.